Today, the New York Times published a terrific editorial in which Bill Bradley examines the difference between the Republican and Democratic infrastructure. It’s a great piece, and it lays out explicitly many of the connections on the Republican side that you normally only see in left-wing blogs. I was particularly heartened that he analyzed the role of the media. Anyone who thinks the media is impartial is fooling themselves. Jabley has a great list of keys to democratic victory, but I think there is only one. Get the media to report on facts and do real journalism. I firmly believe the Democrats have a vastly superior message, one that will easily win elections. On virtually every topic, those who are familiar with the facts of the topic side with the Democratic position. It is those who are not familiar with the topic, or have swallowed the lies that have been fed, that tend towards the GOP. Call the lies out, and you have an ex-Republican. I am convinced this is the absolute truth for the center of the political spectrum. If I can ever get around to digging up the links, I’ll post my 2004 election analysis, which is really only two paragraphs long. Opryland is like Vegas, but without the casino. It’s incredible just to walk around the grounds. We ended up taking a boat ride through the hotel. Yes, a boat ride through the hotel. Enormous gardens, inhouse river, fountains and fish, amazing food. It’s all connected at the hip to the actual Grand Ole’ Opry, as well as a mega-mall. We went to see the Gibson guitar factory. My guitar was made there in 1984. There are no tours on weekends though, so it was just like any other guitar store, except a lot more banjos and dobros, what with being in the south and all. Parking: It was $8.72 a day to park your car. Parking your car is extra!? What!? Mind you, this is not valet parking (that’s $16/day plus tips). No, this is parking your car 1/2 mile away from the hotel in the pouring rain, and being forced to park on the grass and your car makes some awful sounds as it goes over the curb and you walk back to the hotel in the rain after having driven for 5 hours straight with a screaming toddler — that is the experience for which we were paying $8.72 a day. The specificity was irritating also. Yes, I get it, it’s $8.00 with a 9% tax. You couldn’t just call it $8 or $9 even? Resort fee: $5.00 a day, for internet access (we didn’t use), newspapers (we didn’t get), use of the fitness center (we didn’t use), and I don’t even know what else. Neither of these were optional of course. So why don’t they just make it part of the overall room charge? Nothing else gets broken out. When was the last time you saw a hotel bill like this? I hope never. That’s the point of having one charge, to roll up the whole experience into one number. This is good for the hotel and the consumer. The consumer knows what they are getting. The consumer does not spend their whole trip thinking about money, wondering how saracastic to make their blog entry, and vowing never to go back again. I like the new look (“pool”). A little cleaner, a little more graphic. These “themes” look easy enough to customize, but I don’t know when I would find time to make my own. Here’s a little rule of thumb. When two branches of the government pass a bill that only applies to two citizens, that’s not a good bill. I don’t know how many bills meet that description, but I feel confident the rule holds. I didn’t even think it was possible to target a bill so specifically (and probably it’s not, this one is bound to fail any constitutional review). Now that I know that, it does changes my own priorities. Instead of working for the man, I’m going to get me an office on K Street and start lobbying for the Muttrox Family and American Way Preservation Act (MFAWPA). Appoint Muttrox (me) the Traffic Czar for life. More details in a later post on what that entails. Award Muttrox (me) the first American Knighthood. Sir Muttrox has a nice ring. Rusmfeld is fighting Congress. No, not about torture. It’s about budgets, and bringing just a hair of rationality to the procurement process. It’s easy to forget how important this battle is to Rumsfeld. When he was brought on as Secretary fo Defense, his stated goal was to transform the military. He was probably as surprised as everyone else when he had actually had to, you know, run a war and stuff. He has been outspoken for many years about the need for the military branches to have a funding and procurement process that gets them what is needed to accomplish their military mission, not the mission of the arms manufacturers and congressmen. Today’s military is only slowing preparing itself for the post-cold landscape. Considering the amount of our GDP that goes to military expenditures, it is welcome to see Rumsfeld going to war on this front also. Will he be able to buck the “Iron Triangle”? I don’t know, but I give him better odds than anyone else would get. Go Rummy go! To his credit, it sounds as if much of the talk centers around â€œnegotiating,â€ not cramming the Bush plan down the countryâ€™s throat. Itâ€™s pretty much accepted that support for Bushâ€™s plan as initially-conceived is insufficient to win approval; I perceive this effort to be more of an attempt to keep Social Security alive as a political issue rather than an attempt to win Bushâ€™s precise plan. Clearly McCain understands that there will have to be a meaningful middle ground on this issue and I think the â€œcome to the table with usâ€ talk demonstrates as much. Here’s why I disagree with this line of reasoning. 1) There is no Bush plan. To speak of negotiating is absurd when Bush won’t commit to anything. Any criticism against the Democrats for not having a plan of their own is easily answered with that classic, “You first!”. 2) The elements that we know are in the Bush “plan” are non-negotiable. Bush and his allies may refer to “saving social security” or “just making sure it’s solvent” or “giving people more control”, but these are not what their plan is. Their plan is privatizing the system, plain and simple. Note that Bush and Cheney and others have all recently stated that their ideas will do nothing to address solvency. If that is true (and it certainly is), why exactly do you think they want things to change? 3) Their is no meaningful middle ground. There are either add-on accounts or not, there are either carved out accounts or not, you either address the solvency issue or not, you either leave Social Security as an insurance system or transform into a fancy 401(k), etc. 4) It is not that Bush’s plan as initially conceived has failed to win support. It is that the very elements that are central to his “plan” are unpopular. In every setting, the more people are exposed to his plan, the more they dislike it. The more the true costs are known, the more they dislike it. And it is not the “negotiable” parts of his plan that people dislike, it is the central concepts themseleves. That isn’t going to change, because Bush’s “plan” isn’t going to change in any meaningful way. John McCain is now stumping for Bush’s Social Security “plan”. What the hell happened to him? I have always liked McCain. His story is amazing, his independent streak welcome, but his appeal to me has always been his priorities. If there is one single thing that can improve the political structure of the USA, it is campaign finance reform. The influence of money is ubiquitous and pernicious. Witness the travesty of the recent bankruptcy bill, which blatantly screws everyone unlucky enough to be neither a corporation nor a millionaire. There has been no defense given to this bill because there is none. It is a blatant payoff to the credit card industry. This happens to be a particularly egregious example, but the effects go throughout the entire system. As long as that influence is there, it is next to impossible to get representatives who are there to serve the public. At any rate, McCain has always been a proponent and a warrior for campaign finance reform. For this reason alone, I have always been in his corner. But. But. But I feel like he may have scored one too many negatives on my accounting sheet. 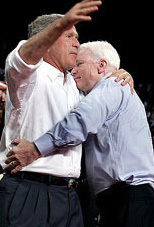 His embrace of Bush’s worst ideas defies his public image. No one who is intellectually honest can stump for Bush’s “plan”. The “plan” such as it is, is riddled without distortions, inconsistencies, and outright lying. I still like to think McCain is basically honorable, but this can simply not be an honest presentation of McCain’s personal views. I see a quid-pro-quo. Despite all the bad things that Bush did to McCain during the 2000 election primaries, McCain has agreed to play ball – and in return Bush will throw his support behind McCain in 2008. No other rationale adds up to me. McCain in 2008, with the full support of the mainstream GOP and Bush administration. You read it here first. I see this in the corporate world. What used to be a problem is now a challenge. What was once an issue is now an opportunity. The idea is that we prove ourselves, and grow ourselves (yes, grow is used as a verb where I work without a hint of self-awareness) in situations where there are challenges. A problem gives you an opportunity to test yourself. And that’s true as far as it goes. A neighbor was telling me how after many years, they finally had their house the way they liked it. I said we hadn’t lifted a finger since moving in. “Oh,” she gushed, “you have so many opportunities ahead of you!” What can you say to that? Gee, I just feel sorry for those poor people with their perfect mansions and perfect lives, having so little opportunity t0 make things better. It keeps me up at night thinking of their plight. If only there was something we could do for them, some kind of equal opportunity program. Yes, that’s it, equal opportunity for millionaires-with-nothing-better-to-do-than-subtly-brag-how-amazing-their-house-is. This is a constituency group that has been neglected.